Jonathan Diaby said as a visible minority, he is used to dealing with racist comments and usually has no problem staying focused on the ice, but he couldn't tolerate seeing his family targeted. 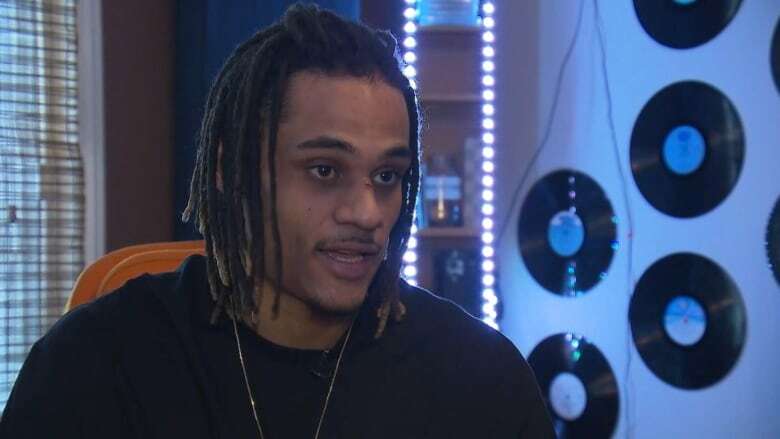 A Quebec hockey league has apologized to a black player who says he and his family left a game before the third period because they were being taunted with racist remarks from the stands. Jonathan Diaby, 24, is a defenceman for the Marquis de Jonquière, a team in the Ligue Nord-Américaine de Hockey, a Quebec-based, semi-professional independent hockey league. On Saturday night, his team was playing against the Pétroliers du Nord, based in Saint-Jérôme, Que., about 60 kilometres northwest of Montreal. Diaby said during the game, he and his family members were called the N-word and compared to baboons. "My dad was told to go back home, that he had no business in this country. People were touching his hair. They were making fun of him. My sister was scared; my girlfriend was scared," he said. He said as a visible minority, he is used to dealing with racist comments and usually has no problem staying focused on the ice, but he couldn't tolerate seeing his family targeted. "That's far beyond what should be happening on a regular Saturday night. No one should feel threatened to go watch his son play a hockey game." It's unclear what prompted the taunts. The league was once known as a home for enforcers and fighters, but it's tried to shed that reputation. However, Diaby said there are still players in the league who are there largely to fight. He said while he was in the penalty box, one fan was taunting him and compared his hair to a mop, trying to get a rise out him. He said he believes the fans were trying to goad him into fighting so he would get thrown out of the game. He said the last straw came after he was assessed his fourth penalty of the game — for high-sticking in the second period. Diaby said while sitting in the penalty box with his captain, Alexandre Quesnel, who was also serving a penalty, he hid his face in his jersey and started to cry. He told his captain he'd had enough. He served the penalty, went to the locker room to change and went to the stands to meet his family — which included his mom, dad, aunt, sister, girlfriend, his girlfriend's little brother and a few of his friends — and they left. Diaby said at one point, the security guards asked his parents and girlfriend to change seats so people "could have a quiet game." He said he wants to see the league ban the people who were involved but overall is satisfied with the league's response to the incident. Robert Chevrier, co-owner of the Petroliers, said the team is trying to identify the racist fans so they can be barred from the arena. 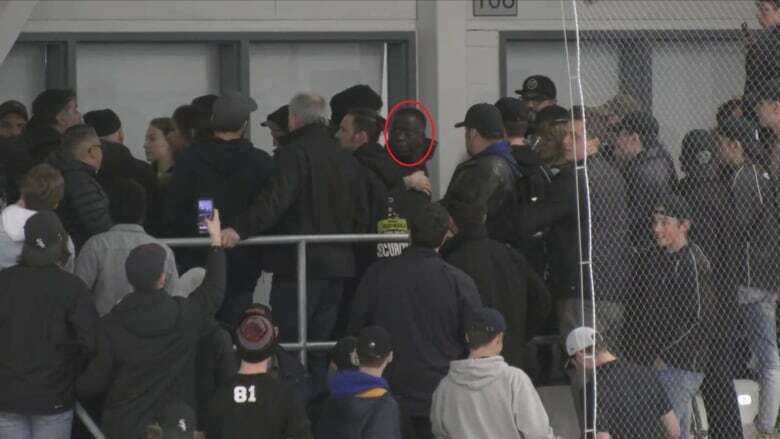 He said the comments were unacceptable, but Chevrier wouldn't blame the security guards, saying they did their jobs by separating groups of people in the stands that had been involved in the altercation. The league commissioner, Jean-François Laplante, called Diaby to apologize and posted a video apology to the league's Facebook page on Sunday. Laplante said racism has no place in society, and he told fans to be respectful. "Intolerance of difference is based in ignorance. To combat this problem, we must speak out," he said. The video also includes messages from a coach and other players across the league, offering Diaby and his family their support. Nicolas Corbeil, who plays on the Saint-Jérôme team, also denounced the comments. "We the players don't endorse that; we will never accept that. Yes, fans, you're allowed to encourage your team; you're allowed to be behind your team 100 per cent, but it's unacceptable to … make racist remarks." 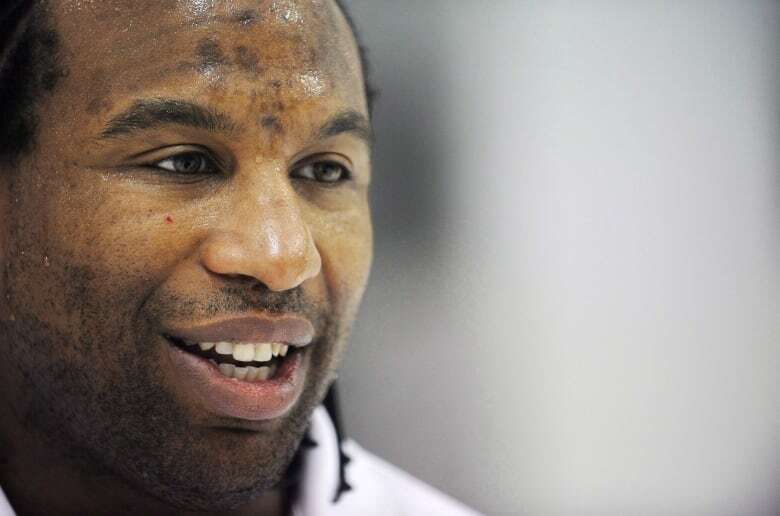 Former NHL player Georges Laraque, who is black, said he had to endure racial slurs when he was playing minor hockey but he never experienced anything like what happened to Diaby. "This is worse than a horror movie, listening to all that stuff," he told CBC Montreal's Daybreak. "Diaby kept his cool pretty good, because if it would have been me, things would have got way worse." He said it's not enough that the commissioner apologized because the referees, security guards and the other spectators were all complicit in allowing Diaby and his family to be chased from the arena. "The people that were there that night who didn't do anything, those are the people that should be sorry about not doing anything — not the commissioner, who is going to be sorry because that's his league, and he wants to protect it." He said he can't believe something like that could happen so close to Montreal. "You would think that with PK [Subban] and many other black players that played in the NHL, in Montreal, in the society things would get better. But, man, this is a way step backwards."